Mumbai, Aug 10: A local court in Maharashtra's Palghar district ordered three persons to clean Virar railway station for three consecutive days for posting a video which showed them taking the "Kiki challenge" on a moving train. The Kiki challenge, started by Canadian rapper Drake, involves jumping out of a moving vehicle and dancing to his song "In My Feelings". 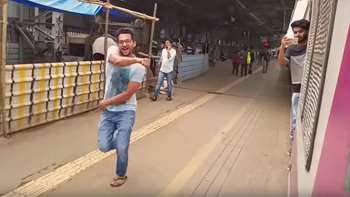 The video, shot by Shyam Sharma (24), Dhruv (23) and Nishant (20) at Western Railway's Virar station, had gone viral on social media after it was uploaded a week ago and had been viewed by over 1.5 lakh people. "The railway court ordered that the three men would clean all platforms of Virar station from 11 am to 2 pm and then, between 3 pm to 5 pm, will create awareness among commuters of the dangers of stunts like the Kiki challenge," the official said. "Not just a risk for you but your act can put life of others at risk too. Desist from public nuisance or face the music! #DanceYourWayToSafety #InMySafetyFeelingsChallenge," the Mumbai police had tweeted earlier against the menace.